I worked as a secretary for 30 years then babysitted my grandbaby for four years. I married Joe Gourley in 1972. He died in 2008. We had 3 beautiful children together. 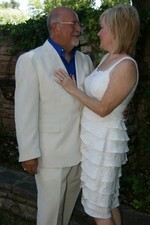 I remarried 6-26-2010 to Billy Johnson. It was a beautiful wedding on Lake Granbury. I'm enjoying not working very much. We just do whatever we want to do. My new husband sits by me at church and I get to listen to his beautiful bass voice belting out the worship songs. I attended Baker, Sam Houston, and Lamar Elementary Schools; then Pampa Junior High, and Dear Ole Pampa High School. I took Business courses and won the 1971 Business Award and won 2nd place in the Area Shorthand Contest. My best friends were Peggy Huff and Cheryl Williams. Peggy and I got her car stuck in the sand pits out by Lefors and spent the night listening to the oil wells pumping. Helicopters were out looking for us at the crack of dawn. We walked into Lefors and called for help (before cell phones). Shirley Matney Johnson has a birthday today. David Lewis posted a message on Shirley Matney's Profile. New comment added.